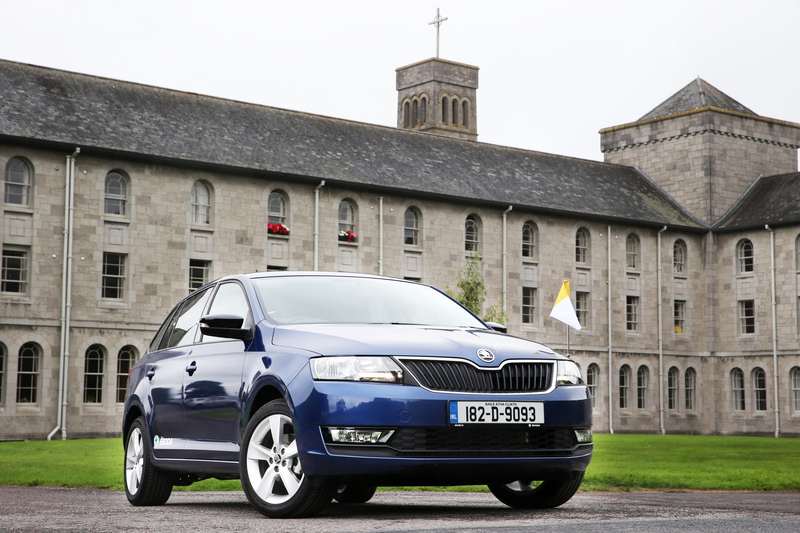 Since the Pope’s on a visit to Ireland, let’s take a look at some papal cars. Heads of state tend to be pretty staid in their transport choices – big, sober limousines are usually the order of the day. But the head of the Catholic church is able to have a bit more fun with his choice of vehicle. The Pope’s transport has to protect the pontiff, while allowing him to commune with the adoring crowds that characterise his visits. 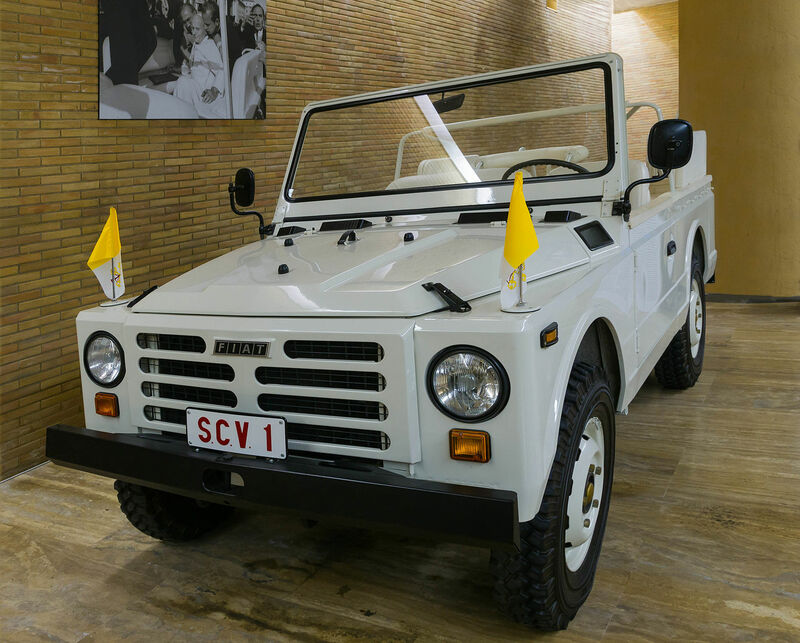 As such, a custom ‘Popemobile’ tends to be the vehicle of choice – affording his Holiness a commanding view of his surroundings atop a raised platform surrounded by bulletproof glass – deemed necessary after the assassination attempt on Pope John Paul II in 1981. That’s not to say the Pope exclusively travels by Popemobile – there are a few other vehicles blessed enough for him to use. 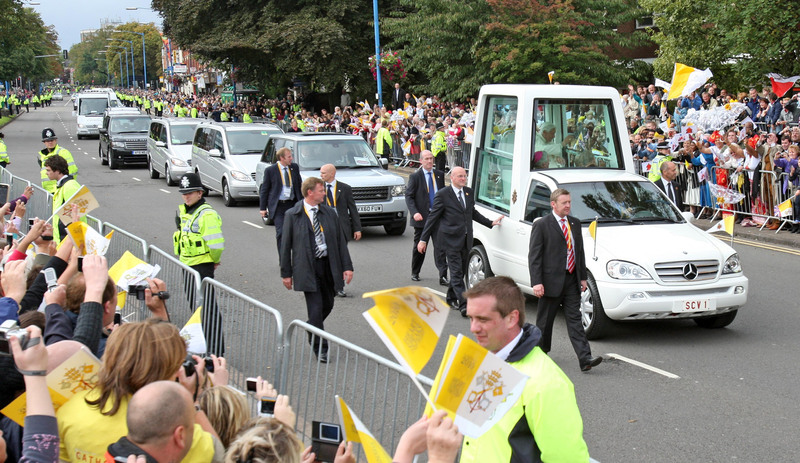 This is perhaps the best-used and most recognisable Popemobile around. Based on a 2007 Mercedes M-Class SUV, it features a raised platform at the rear, with a full-height door and steps leading into it. Inside, there’s a handrail so that his Holiness can stand and wave, but there’s also a pair of comfy seats in case the weight of all that Catholicism gets to be too much to handle. 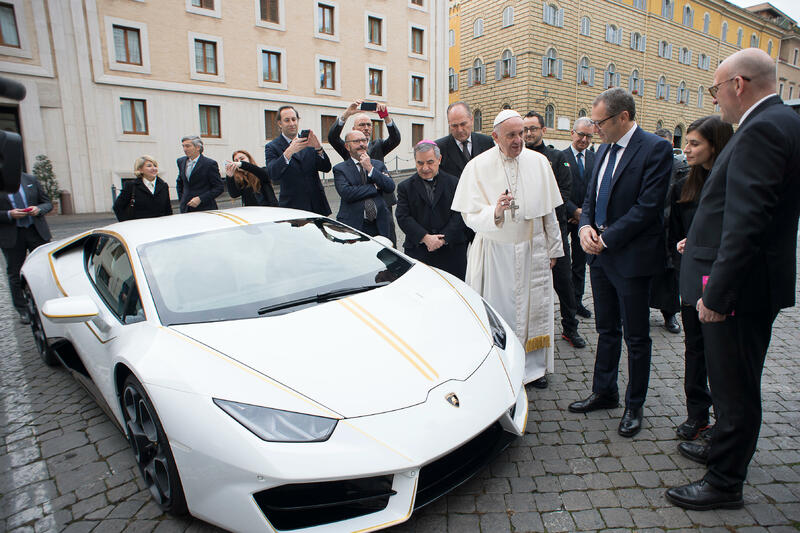 Being the Pope isn’t always easy – after all, if you were gifted a customised Lamborghini Huracan, you’d probably want to get in and go for a drive. But with the Vatican boasting so few roads, there’s little point in ownership – so when Pope Francis was given this gift by the Italian supercar manufacturer, he instead decided to sell it. Resplendent in papal white with gold detailing, the Lamborghini fetched £630,000 for charity when RM Sotheby’s auctioned it off earlier this year. The Pope’s signature on the bonnet possibly helped the sale along. When Pope John Paul II visited the UK for five days in 1982, he was transported around in something a little heftier than the traditional Popemobile – a necessary evil due to an attempt on his life just a year earlier. 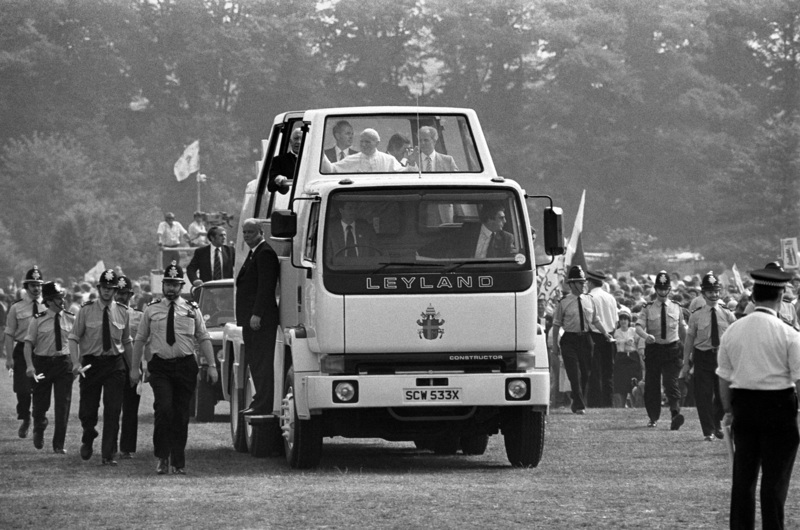 The response from the UK was this monster – the 24 ton Leyland Popemobile. It rode on a Leyland Constructor chassis, which was chosen because of its ability off-road as well as impressive acceleration for a commercial vehicle. Visitors to the British Commercial Vehicle Museum can still see the first of two such popemobiles in all of its glory. The current Pope, Francis, is well-known for being a very humble man – eschewing the finery of many of his predecessors and leading a less grand existence than you may expect. The same is reflected in his own personal transport, which is over thirty years old. 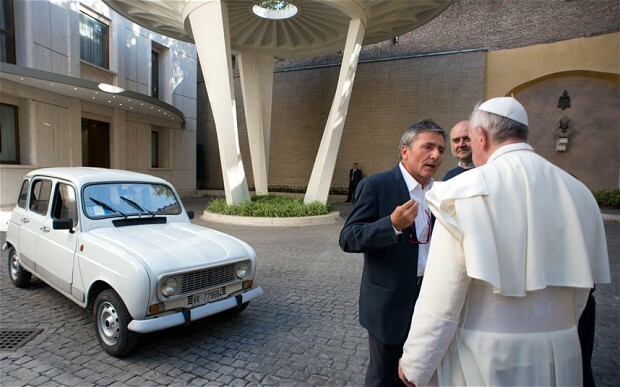 The Renault 4 was gifted to Francis by Father Renzo Zocca of Italy, and his Holiness uses it to nip about the Vatican. With the Vatican being fully surrounded by Italy, it’s no surprise that the pontiff spends a lot of his time in Fiat vehicles. This Campagnola is one of the more popular models, but fell out of favour in 1981 after an attempt on Pope John Paul II’s life. Since then, most Popemobiles have been fitted with bulletproof glass. Not all Popemobiles have to be based on SUVs. 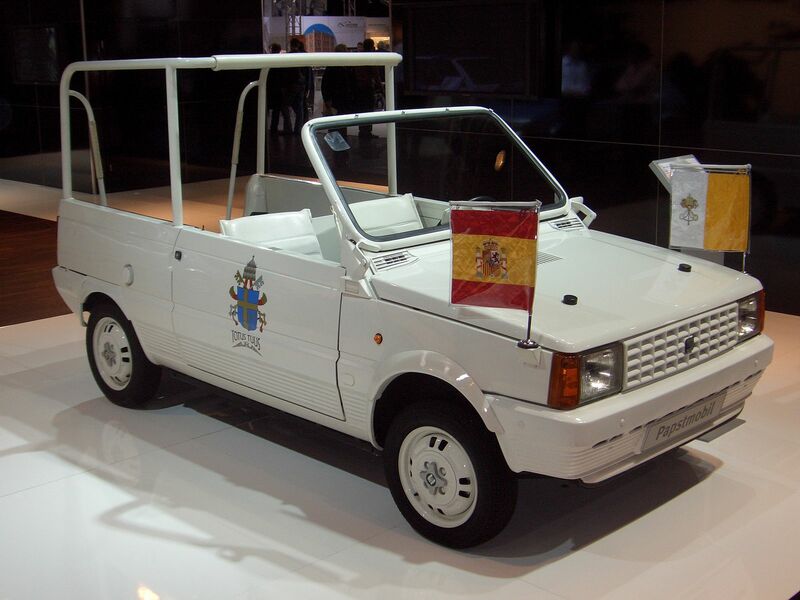 This adorable Seat Panda – build on Fiat Panda designs under license by Spanish brand Seat – was used in 1982 during John Paul IIs visit to Spain. The 400th and final Ferrari Enzo was gifted to John Paul II by Ferrari – another example of a Pope being given a supercar he can’t drive. It’s presented in a rare Rosso Scuderia colour, with a unique bare carbon-fibre spoiler. It was auctioned off in 2005, sadly after the death of John Paul II – but his successor, Benedict XVI, received a cheque with the proceeds to be donated to charity. 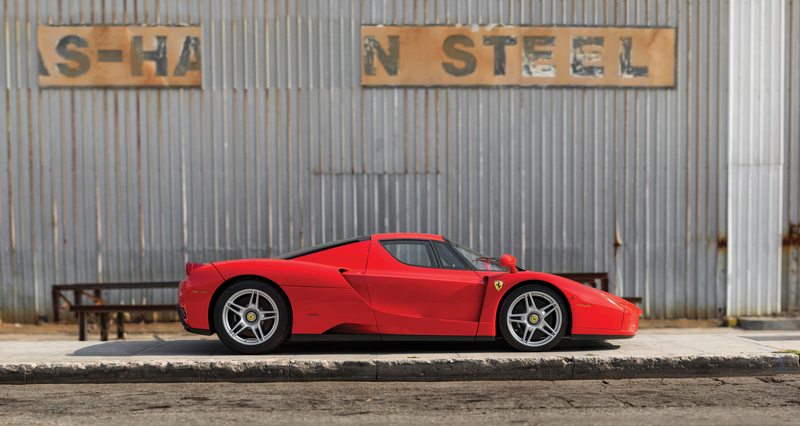 The Enzo was last sold in 2015 by RM Sotheby’s, making over $6 million. The latest transport to be used by his Holiness is slightly more auspicious than some of its predecessors. Currently being used by Francis on his visit to Dublin, the modified Rapid has been donated by Skoda of Ireland, and comes equipped with toughened glass, flag holders on the front wings and a custom armrest to keep the pontiff comfortable. Previous article Mike Brewer Vlogs: A busy week ahead! Mike Brewer Vlogs: A busy week ahead!